A larger three-bay design and carrying three times the bomb load of the G.II, the G.V entered service in 1918. 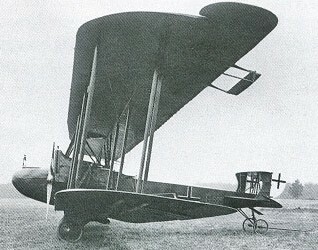 The G.V was AEG's last bomber, the end of the war prevented the G.V from becoming operational and it was after the war that a number were operated as six-passenger civil transports by Deutsche Luft-Reederei - an airline company financed by and connected with AEG. In 1919 the G.V was the only large German 1914-18 aircraft employed commercially to any great extent. As a makeshift transport (with an open cockpit for passengers) a Limousine version was developed. This had a new cabin fairing attached to enclose the passenger area, a downward-hinging fuselage nose to provide a baggage locker (which could also act as a buffer if the aircraft overturned) and a toilet aft of the cabin. One was recorded as flying from Berlin to Eskjo, Sweden in 4 hours and seven minutes.